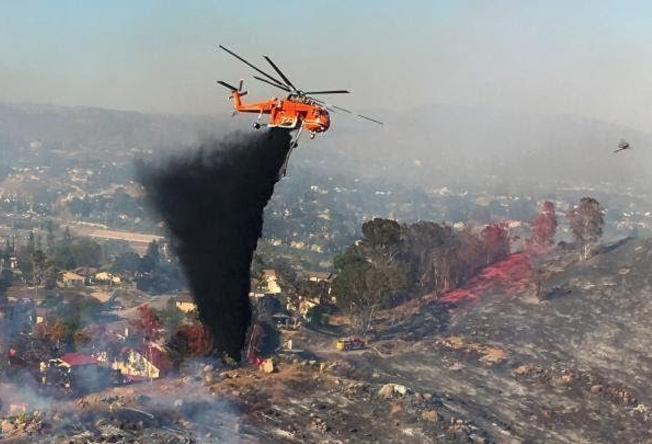 Giant Aircrane drops retardant The giant Aircrane contracted by SDG&E drops retardant on a 2018 fire in Alpine. 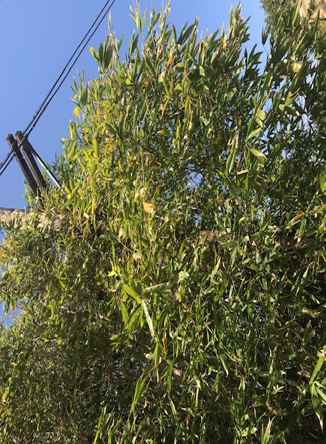 Homeowner called SDGE about trimming brush. Nothing was done. Poles in this San Diego neighborhood are at risk of loss in a wildfire. PG&E Pushes Back on Judge’s Proposals to Prevent Wildfires March 25, 2019 by Sudhin Thanawala Pacific Gas & Electric Co. is pushing back on a U.S. judge’s revised proposals to prevent the utility’s equipment from causing more wildfires, saying it could not “monitor every tree at every moment of every day” to ensure they don’t pose a threat to its electric lines in violation of California laws. PG&E also objected to Alsup’s proposal to ban it from paying dividends to shareholders until it meets his vegetation management requirements. The company said that requirement would substantially hamper its ability to raise money from investors, which in turn would affect its safety efforts. The company has already suspended dividends and said it will not pay any at least until it emerges from bankruptcy. The company sought bankruptcy protection in January in the face of billions of dollars in potential liability from recent wildfires.